In 1928–9, the D'Oyly Carte Opera Company took an extended American tour. 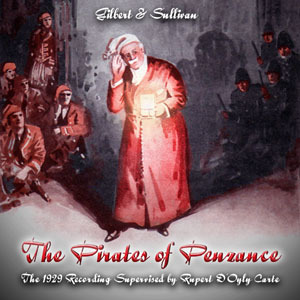 Two recordings were made during this period, the 1928 Yeomen and this one of Pirates. 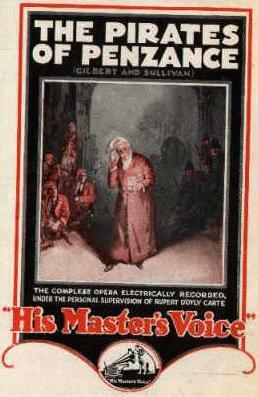 Both featured a mixture of non-D'Oyly Carte singers and former Company members. Leo Sheffield, Derek Oldham, Elsie Griffin and Nellie Briercliffe are all among the most important D'Oyly Carte singers of the early years of this century, and it is a fortunate coincidence indeed that they were not with the Company in America at the time this recording was made. Dorothy Gill had just ended a stint as principal contralto with D'Oyly Carte's "New" Company, and she would take over the same parts with the main Company after Bertha Lewis's death. George Baker and Peter Dawson were important recording artists of the era, although they had no G&S background. Dawson has the additional distinction of being the only singer in all of G&S whose vocal pedigree is even more distinguished than that of Martyn Green. Green was a Garcia pupil, surely the last active one. But Dawson was a pupil of Sir Charles Santley! This recording has been one of the more popular historical re-issues, as shown in the issue history below. It is open to question who is best fitted to judge of the merits of a Gilbert and Sullivan recording — the old-timer with his cherished memories or the strictly modern man, devoted to Strauss and Stravinsky. Both have their disabilities and their prejudices. The older critic will naturally be jealous for the fame of his old favourite Savoyards and will be keen to detect anything which, in his opinion, is false to the honoured traditions. But, equally, he will be emotionally inundated by those floods of reminiscence which are inevitably loosed upon surviving Victorians the moment the old melodies are heard. He will be carried back, unresisting, to the dear but dingy London of the 'eighties, with its hansom cabs and gas-lit streets, its frock-coats and its waterfall bustles, its exhibitions and its Fenian outrages, its talk of "Dizzy" and the G.O.M., and the dear old Savoy in the heyday of their fame. Keen, competent criticism can hardly expect to emerge from this swirling mist of fond memories. And yet the strictly modern man is in no better position; he is saturated with the highest and best in music, or blasé with a surfeit of jazz and revue. However, I tried the new H.M.V. recording of the Pirates on both dogs — the young and the old; and the Pirates captured them both. 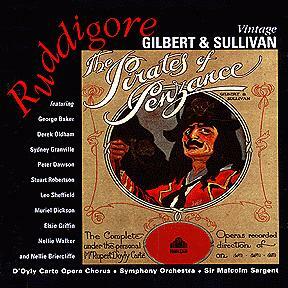 It could hardly have been otherwise, for this new recording represents the high-water mark so far as Gilbert and Sullivan is concerned. In each of the previous Savoy albums there have been occasional lapses which prevented one from awarding them unqualified praise; but with the Pirates it is happily otherwise; from first to last, and in every bar, a simply delightful production. The cast is a strong one — Elsie Griffin, Derek Oldham, Leo Sheffield, Peter Dawson, George Baker, Stuart Robertson, Dorothy Gill, Nellie Briercliffe and Nellie Walker, with as competent chorus as one could wish. Elsie Griffin and George Baker carry off the chief honours, but that does not mean that Peter Dawson and Derek Oldham and the others do not equally demand unstinted praise. The former's rendering of I am a Pirate King will leave the most ardent Savoyard nothing to sigh for, and, as for Derek Oldham — well, he is quite himself, which is all one need say. It is Elsie Griffin, however, with her deliciously fresh and effortless singing, who demands — and receives — the big bouquet. Her Poor Wandering One is a sheer joy — brilliant but never shrill, and with trills that would not discredit the great Galli-Curci herself. It may be my imagination, but Miss Griffin seems to me to be in better voice in the Pirates than in any of the previous operas in which she has been recorded. The Major-General's song, that breathless non-stop affair of difficult words and tricky rhymes, is about as severe a test of articulation as any song I know; but George Baker comes through it magnificently. Not a syllable is lost — nor any of humour. It would be unjust to pass over the chorus without high praise for their perfect discipline (although that is what one expects of a Savoy chorus). The ladies' chorus is particularly charming, with none of that "breathiness" which mars so many choral pieces. Yes, the Pirates will certainly be warmly welcomed by all Savoy enthusiasts, and by the newer generation of music-lovers too. Recordings of this quality will make many converts among those who have hitherto regarded Gilbert and Sullivan as merely a Victorian relic. A libretto (price 1s.) is published by Messrs. Chappell & Co., but one feels that it might have been included with the set of records. 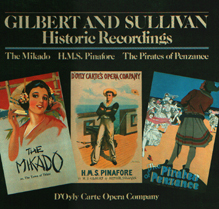 1982 Arabesque LP 71-6453 Four discs issued by the Book-of-the-Month Club, with the 1929 Pirates (2 1/2 sides), the 1930 Pinafore (2 1/2 sides) and the 1936 Mikado (3 sides). For side 9, Francis [JF] reports a different matrix number from that Chris Webster [CW] found in his personal collection. The table above shows the published takes in the order recorded. Where a session produced both unpublished and published takes for the same selection, the unpublished matrix numbers are shown in italics. Where none of a selection's takes from a given session were published, the entire row is shown in italics, and the side number is blank. Where it is not possible to make a likely guess about the number of takes recorded at a session, this is indicated with .... Where the published take was achieved without a make-up session being required, the unpublished takes for the same selection are not shown. This recording of The Pirates of Penzance seems to have been particularly difficult, as evidenced by the unusually high number of retakes. Nine of the twenty-two selections did not produce an acceptable take at the originally scheduled session and had to be redone at a make-up session. The table above is a speculative reconstruction of what occurred. The convention was that the base matrix number (i.e., the five digit number after the prefix 'Cc') remained the same, and the suffix (i.e., the number after the hyphen) showed the take number. Thus, the first part of the overture, having a published matrix number of Cc15910-9A, seems to have required nine takes. The base number, 15910, fits with the sequence of matrix numbers assigned on 19–20 February, so the first take, and most probably the first two takes, were made at that time. Without seeing the artist sheets, it is impossible to know how many takes beyond the first two were recorded on each date. Thus, Cc15910-1, probably Cc15910-2, and an undetermined number of additional takes for that selection, were recorded on 19 or 20 February. The ninth take, and possibly one or more others, were recorded on 15 May. It would have been unusual to record more than three takes for a selection on the same day. Therefore, it is likely that the first part of the overture was recorded on at least one other date without an acceptable take being produced. The artist sheets could fill in other details. Besides the problematic overture, several of the other sides may well have been attempted at more than two sessions. We know, for example, that s. 17 was initially recorded on 19 February, and the published side (the sixth) was recorded on 25 March. It is a distinct possibility that further takes were attempted at one of the intervening sessions. Particularly notable is s. 3. The published take, the fifth, was recorded on 19 April, and no other sides were recorded that day. If the company had known on 25 March that this side needed to be redone, they likely would have done so while the artists were already present. More likely, a test pressing made sometime after 25 March revealed problems with the side, and the artists had to be re-assembled. Perhaps further takes of the overture were also made on 19 April.